It's Hip 2 Serve! : FREE Sample & Coupons for Tampax Pearl and More! 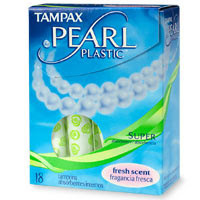 Click here to sign up to receive a FREE sample of Tampax Pearl and Tampax Compak Pearl. You can also sign up to receive coupons by mail for Tide Stain Release, Downy Fabric Softener, Febreeze, Crest Whitestrips Advanced Seal, Aussie products, & Venus Embrace or Spa Breeze Razor. Samples and coupons should arrive within 4-6 weeks.